Rescue crews first helped the person who was stuck upside hanging from a crane. The person was reported trapped on the ride upside down around 7:55 p.m., but did not appear to be injured or in medical distress, officials said. He remained hanging upside down for about 40 minutes before he was rescued with the help of a fire department ladder struck. 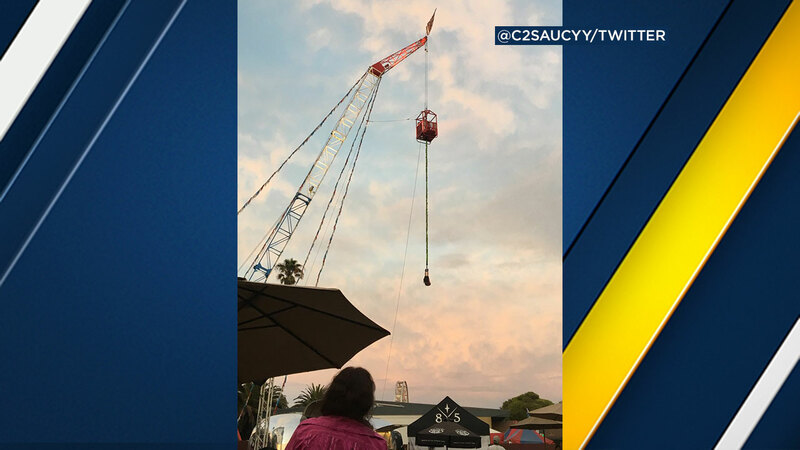 After that rescue, two people remained inside a box hanging from a crane stuck high above the fairgrounds for more than an hour as crews worked out a plan to get them down. One-by-one, the two men individually attached themselves to harnesses and were able to safely rappel down to the ground on a rope. Wednesday was the opening day of the fair, which remains open through Aug. 13. After the initial rescue of the person hanging upside down, while the two fairgoers remained inside the suspended cage, activities at the fair appeared to resume as normal. The Midnight Rider Band played on a stage just below the suspended box.